Reading and share top 9 famous quotes and sayings about Electoral College by famous authors and people. 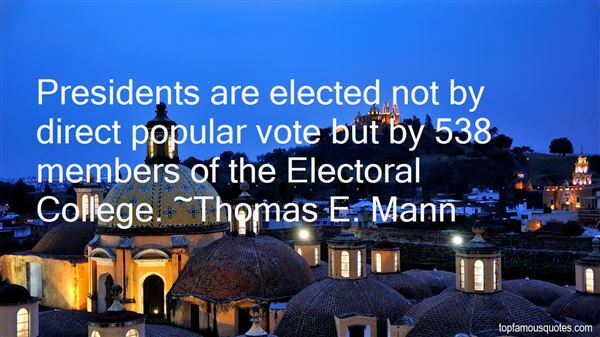 Browse top 9 famous quotes and sayings about Electoral College by most favorite authors. 1. "I know that of all the great shifts that have occurred in America--the freedom of slaves, the rights of women, the equality of gays and lesbians--none has happened easily, and certainly none has happened instantly and without serious attacks and backlash. But the reason we have these things is because the fair-minded people who came before us would not give up. In my life, I have seen elections stolen--either outright or through the electoral college. I have seen wars fought because there was no other way to get peace. I have seen the rich get richer and I have seen the poor get poorer. I have seen facts get harder and harder to hide--and easier and easier to manipulate. I have been angry and I have been frustrated and I have been ecstatic and I have been proven right and wrong and back again. I have given up on some things, but I have refused to give up on most things. And I can honestly say that all of it--all of it--seems to have led me to where we are, here and now." 2. 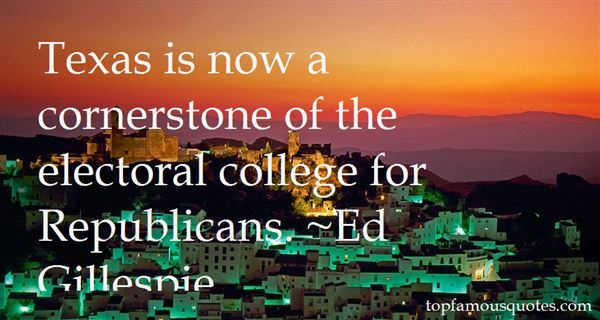 "Texas is now a cornerstone of the electoral college for Republicans." 3. "A less well known impact of immigrant populations is the increase that destination states gain in Congress where apportionment of seats in the House of Representatives is calculated on the basis of a state's entire adult population regardless of legal status. And, because each state's electoral college vote is the sum of the number of its representatives in the House and its two senators, high immigration states play a larger role in presidential elections than they might if only adult citizens and legal aliens were counted in population surveys." 4. "It's clear enough that there was substantial fraud in Ohio, thus delivering the Electoral College vote for President Bush." 5. 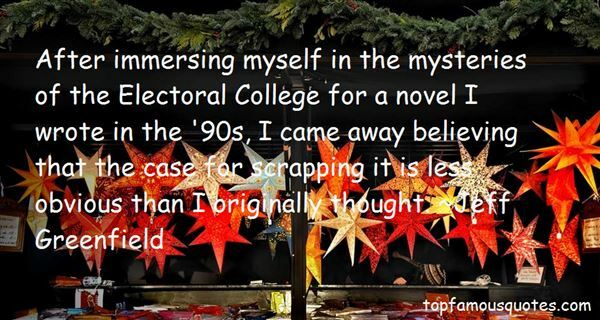 "After immersing myself in the mysteries of the Electoral College for a novel I wrote in the '90s, I came away believing that the case for scrapping it is less obvious than I originally thought." 6. "Much as banks don't care where your money's coming from, the Electoral College is all 'don't ask, don't care' when it comes to votes." 7. "I would anticipate that the Electoral College will be held on the 13th of December, and our 20 electorate votes will go to the certified winner." 8. "As a final indignity for the defeated warrior, Vice President Nixon had to preside over the roll call of the Electoral College. "This is the first time in 100 years that a candidate for the presidency announced the result of an election in which he was defeated," he told the assembled members of Congress. "I do not think we could have a more striking and eloquent example of the stability of our constitutional system." He got a standing ovation." 9. "Presidents are elected not by direct popular vote but by 538 members of the Electoral College." I'm aware that I'm very fringe, and it's nice that way."